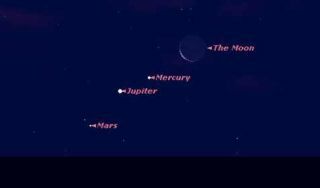 SKY MAP: Just before dawn local on Feb. 22, Jupiter and Mercury will be easy to find using the moon as a guide. Mars will require binoculars. This month you'll have an opportunity to see all five naked-eye planets – but not all at once. Two of them are evening objects, while the other three are clustered together low in the east-southeast sky deep in the dawn twilight. The planets move around in our sky and become brighter and dimmer over time depending on where they are in their orbits around the sun. Uranus, Neptune and Pluto are never visible to the naked eye. If you ever wanted to see a planet so bright it will take your breath away, this is your week and Venus is the planet. It hangs lantern-like, high in the west as darkness falls. It's so bright now that you should have little trouble finding it even before sunset in a clean, deep blue sky – which is also a good time to look at its dramatic crescent shape in a telescope. As dusk starts to fade, this unrivaled heavenly lamp can scarcely be missed — you won't need a map. Venus sets more than 3 hours after the sun. Venus is now at the pinnacle of brilliancy for this current evening apparition. Viewed through a telescope in the coming weeks, its crescent grows larger but thinner as the planet approaches the Earth in the celestial scheme of things and shows us more of its night side. By month's end Venus is similar in apparent size to Jupiter – but less than one-quarter of it is lit. Gray markings in the planet's cloud cover remain quite subtle. Look around sunset, when the sky is brighter and Venus's crescent is less dazzling than it becomes after dark. Also, watch for signs of the mysterious ashen light – a still unexplained illumination that some observers have occasionally noticed in parts of Venus's night side. On the evening of Feb. 27 the Americas will be greeted with one of the most spectacular Venus-crescent moon conjunctions possible. The pairing will persist from before sunset into the depths of darkness. Venus will sit about 1.5-degrees above and to the right of the three-day old crescent. Be sure not to miss this! The next planet to look for is Saturn. This week it comes up above the eastern horizon about 90 minutes after sunset, but by the time of its opposition to the sun on March 8 it will be visible all night from dusk to dawn. Two nights later, on March 10, Saturn will ride high above the full moon. Brightening slightly from magnitude +0.7 to +0.5, Saturn appears twice as bright as the bluish star, Regulus, the brightest star of Leo, the Lion. Shining sedately with a yellow-white hue, Saturn appears far to the lower left of that first magnitude star during the evening. If you have a telescope magnifying at least 30-power, you'll be able to glimpse the famous ring system, which now looks like a bright line that bisects Saturn's disk. The rings open slightly to 2.3-degrees from edgewise by the end of February, but the rings will start closing again later this spring, ultimately disappearing even in big telescopes by midsummer. The other three planets visible are morning objects. Two of these are visible toward month's end but with some difficulty: Jupiter and Mercury. Solar conjunction for Jupiter was on Jan. 24; by the final week of February it'll be on its way back into view, appearing a little higher each day. Off to its upper right will be fainter Mercury. Bring binoculars for this challenging sighting; the two planets will be very low above the east-southeastern horizon about 30-35 minutes before sunrise. Just before sunrise on the 22nd, seek out the slender sliver of an old crescent moon, just 2-½ days before new phase, low near the east-southeast horizon. If you find it, use it as your guide to locate Mercury and Jupiter, located about 5 or 6-degrees to the moon's lower left. Binoculars will help. Jupiter and Mercury engage in a close conjunction early on the morning of Feb. 24, with Jupiter appearing to stand almost directly above Mercury; they're separated by 0.7-degree. For comparison, the moon's apparent width is 0.5-degree. The place to look is very low in the east-southeast. Mercury shines at a respectable magnitude -0.1, but still appears only about one-sixth as bright as Jupiter's -2.0. The only planet seemingly out of the loop in terms of visibility is Mars. Shining at magnitude +1.3 and rising deep in the glow of dawn less than an hour before sunup, it's not yet a naked-eye object for mid-northerners. Nonetheless, on the mornings of Feb. 16, 17 and 18, Mars and Jupiter will be separated by less than 1-degree. On the 17th, in fact, Jupiter will appear just 0.6-degree to the upper left of Mars. So if you can locate Jupiter, you should be able to find Mars with binoculars or a small telescope. And with Mercury close by this makes for a planetary trio. For those Space.com readers living south of the equator, these three planets will appear a bit higher and against a somewhat darker sky; hence making them easier to see.